Gravestone Mod 1.12.2/1.11.2 adds a gravestone to the game, which “spawns” at player/villager/dog/cat death. Also this mod generate cemeteries in some villages, and a “Wither’s catacombs”. This is a new huge structure, like stronghold, where you can find a lot of loot, dangerous adventures and a “Wither Boss” at the end. The gravestones are the main “components” of this mod, which are generated at player death. They will store all your items(can be changed in configs), some information about your death and the amount of days which you had been living. There are several types of the gravestones. Each of them can be made of different materials. The generated grave type will be chosen randomly, but its material will be based on biome and your level. Also there is a 25% chance one that of your swords will be used as a gravestone. If you are killed by magic your gravestone will looks enchanted. A gravestone can be generated at villager’s/pet’s(dogs’, cats’, horses’) death too. Those graves will contain a corpse of killed creature(which can be resurrected on the Altar). Also these graves will have special models(dog/cat/horse statue). To take items back you need to destroy a grave or to click on it with a shovel in your hand(in this case grave will not be destroyed). The gravestones can be picked and put at any place, but only on any “diggable” blocks(it can be changed in the configs). But all information will be saved only if a gravestone was picked by a silk touch pickaxe. Some of the gravestones may have flowers on it. This feature was made only for a decorative purpose. Just click on a gravestone with a flower in your hand and it will be placed. To remove it click on it again with shears. 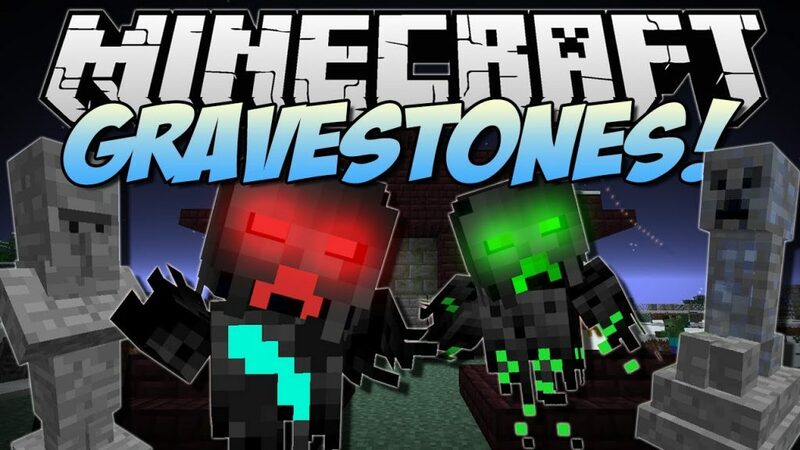 Another one important feature of the gravestones – is a mob spawning at night and at thunder, but only if a player is in the range of 35 blocks from a grave and there is not any source of light near it. Mostly spawned mobs are zombies and skeletons(with a bow or with a stone sword), but in some cases it can spawn a wither skeleton or a zombie pigman. Pets’ gravestones can spawn zombie and skeleton cats and dogs. Also if you have installed a “Mo’creatures” mod some cretures from it will be spawned by graves too(“Silver skeleton”, “Wraith” and “Flame wraith”). The next time-based night feature is a fog. Every grave creates some fog around it during nights, it dencity depends on amount of graves. “A warrior’s grave” – it contains some parts of armor, sword and bow. All warrior’s graves use their sword as a gravestone. “A wizard’s grave” – as you may expect, this type of graves can contain some potions, magic books and ingredients. The wizard’s gravestones can be made of quartz, redstone or lapis lazuli. “A miner’s grave” – in this graves you can find a pickaxe and some useful resources, such as diamonds, emeralds, gold… Mostly the gravestones made of the pickaxes material. “A worker’s grave” – this type of graves mostly contains some useless staff and, in some cases, instruments – an axe or a shovel. “A traveller’s grave” – this is one of the most interesting grave types, cause it can contains such rare items as music discs and eggs of peaceful creatures. These graves are made of emerald. These are decorative blocks. Like gravestones there are some types of them which made of different materials. Furthermore they can contain some text. All of them, except creepers statues, can be crafted or generated in the world and in some villages. Unlike others memorials, creepers statues can’t be found in the world, or crafted. They are dropped at charged creepers death. Also you can find them in catacombs. Next types of memorials – gibbets and some others objects of tortures. You can find them only in some villages or craft it, but in this case you must place a mob’s corpse on it by self. Currently you can craft them only with villagers’ corpses – just click on it with a corpse in hand. These objects work like “vanilla” spawners, except one thing. A skeleton spawner can spawn any type of skeletons(Skeleton cat, Skeleton dog, Skeleton and Wither skeleton(with a low chance). The skeletons will be spawned with a stone sword/bow in hands. Like a skeleton spawner a zombie spawner can spawn any type of zombies creatures. Wither spawner is a special type of spawners, which can be found only at the end of the catacombs. Instead of others spawners it can be used to spawn Wither only once. After it will be destroyed. This spawner can’t be crafted(can be changed in the configs). Undead pets are new mobs which are added by this mod. There are four types of them: zombie dogs, zombie cats, skeleton dogs and skeleton cats. They are rarely can be found in the world – mostly only in the natural habitat of their live form. You can likely see them on cemeteries, cause they raised from their graves at night time. Skeleton cats and dogs are faster then their lived form. At the same time zombie cats and dogs, like a minecraft zombies, are hostile not only to players – they will try to kill every villager, dog, cat and horse. Surely this unlucky pets will be transformed to zombie too. Skull crawlers – small spider-like undead mobs, which look like a skull with small legs. These mobs can crawl over walls, go thought webs and cast some debafs: skeleton skull crawler – slowness, zombie skull crawler – hunger, wither skeleton skull crawler – wither. Further more skeleton skull crawlers have another ability – like a silverfish it can hide in bone blocks. This mobs can’t be naturally spawned in the world(except wither skull crawlers, which can be spawned in Nether). Instead of it they can be spawned with some chance at death of some monsters(zombies, skeletons and wither skeletons). But at the same time there is one good thing – these mobs can drop their skulls as rare drop at death.